and we must use ID attribute value as Name in SDK.. This is good somewhere deep in the code, where you can leave the comments, but in view’s criteria this is not very user-friendly (in fact, you can leave XML comments <!– –> inside of the criteria, but they will lost when you will import management pack to SCSM). To solve that problem SDK support the $MPElement$ token. This token can be used in queries, as parameter for workflow and in other places. This token will replaced by ID of management pack object. This token can exist in two forms: $MPElement$ and $MPElement[Name=’full_element_name’]$. In first case, token will be replaced with ID of the current element. The current element is depend from context. For instance, if $MPElement$ used in view’ criteria, the ID of the view will be used (but this is absolutely no sense in criteria). If token used as parameter of the workflow, the ID of the workflow will be used (this is more useful because sometime you need to get workflow’s object inside of your code). The SDK will do all job for you: the $MPElement[Name=”CoreIncident!IncidentStatusEnum.Active”]$ will be replaced with real ID during execution of the query. If you read all above carefully then you note that $MPElement$ can not be used against elements defined in unsealed management pack (except cases when both elements, target and source, located in same MP). Imagine situation when you define new enumeration for Status in unsealed management pack A and want to use in view’s criteria defined in management pack B. The reference can be created only against sealed management packs, so you can’t use $MPElement$ token in this case, but you still able to use ID in Guid format. But if you want to create view in management pack A then you can use $MPElement$, just skip the alias part in name. 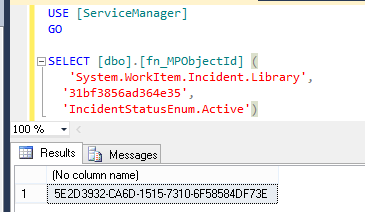 The http://Microsoft.EnterpriseManaement.Core.Criteria/:Value element is invalid – The value $MPElement[Name=”Incident!lncidentStatusEnum.Active”]$ is invalid according to its datatype ‘http://Microsoft.EnterpriseManagement.Core.Criteria/:UniqueIdentifierType’ – The Pattern constraint failed. The answer in datatype: it expect the UniqueIdentifierType, Guid, but has a $MPElement$ in fact. As you know, the $MPElement$ will be replaced with real guid, so you can safely ignore this exception. Thanks, just needed this solution. 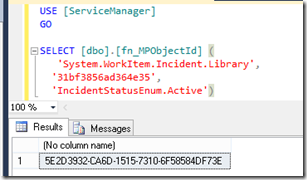 Error XML Criteria in C# and Visual Studio Web Part. The provided path ($Context/Property[Type=’CoreService!System.WorkItem.ServiceRequest’]/Status$) was not valid: MPElement references require a ManagementPack be provided for resolution.